We are very pleased to announce this lecture with Dr. Terry Wahls, worldwide lecturer, professor, and author. This event is FREE and open to the public. Seating is limited – reserve your tickets below. 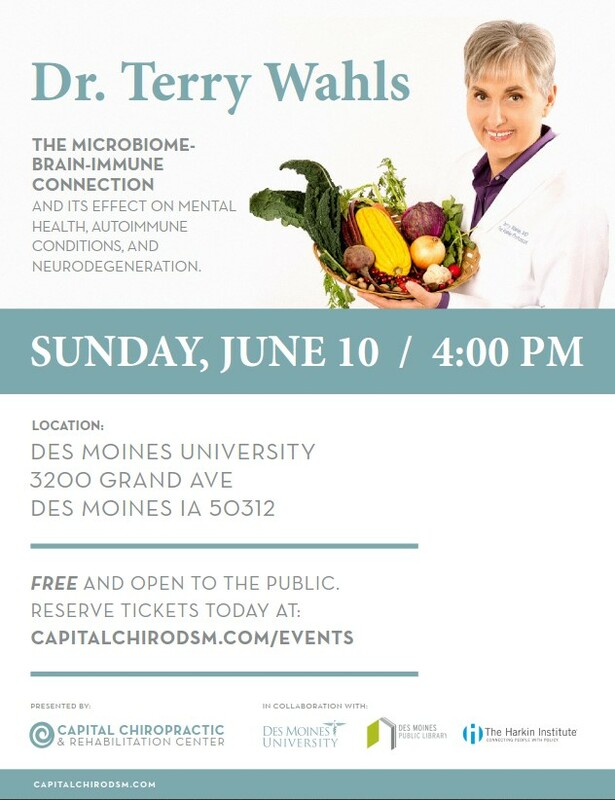 In this lecture and Q&A, Dr. Terry Wahls will discuss the connection between the microbes that live in our bowels and our overall health and well-being. More studies are showing that our brain’s immune cells are deeply connected to the microbes that live on and in our body. More studies have linked the microbiome to mental health issues, including depression, anxiety, attention problems, autism spectrum disorder, and neurodegenerative disorders like Parkinson’s and Alzheimer’s, as well as autoimmune problems such as rheumatoid arthritis, psoriasis, inflammatory bowel disease, and multiple sclerosis. The good news is there is much we can do to shift the mix of microbes from disease-promoting to health-promoting. 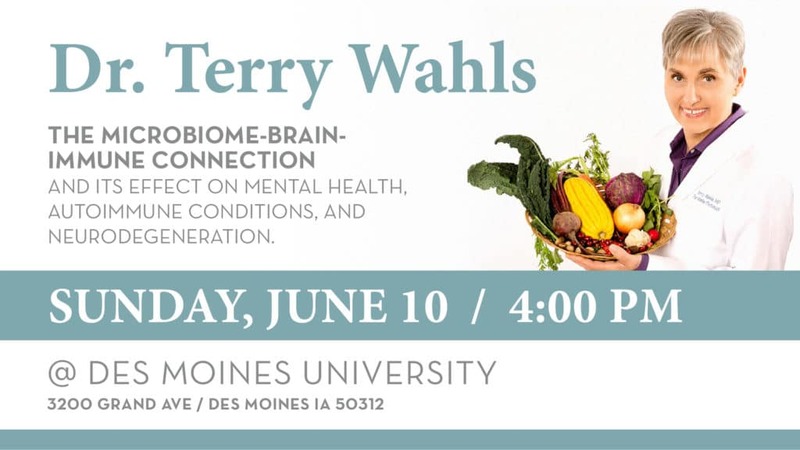 In this lecture, Dr. Wahls will discuss the impact of our microbiome on our brain, mood, and immune cells. She will also discuss specific steps you can take to improve the microbiome and create health. Dr. Terry Wahls is a clinical professor of medicine at the University of Iowa where she conducts clinical trials. She is also a patient with secondary progressive multiple sclerosis, which confined her to a tilt-recline wheelchair for four years. Dr. Wahls restored her health using a diet and lifestyle program she designed specifically for her brain and now pedals her bike to work each day. She is the author of several books, including The Wahls Protocol: How I Beat Progressive MS Using Paleo Principles and Functional Medicine. This event is presented by Capital Chiropractic & Rehabilitation Center in collaboration with Des Moines University, The Harkin Institute, and Des Moines Public Library. The lecture will be 45 minutes with 15 minutes of Q&A moderated by Dr. Chris LoRang of Capital Chiropractic & Rehabilitation Center. Dr. Wahls is recruiting participants for a clinical trial to test dietary dietary approaches to treating fatigue in MS. If you or someone you know might be interested, please see this explanatory brochure and act soon to be included in the study.